In a world still reeling from 11 September, it is time to look at potential solutions. Solutions to problems which have been with us for decades - or are unique to the new millennium. Sometimes the pace of change can be mind-boggling. To keep up we have to respond quickly. This second series of IF aims to involve you in the options that lie ahead for you, and for your children. The future, of course, is not here. So IF tries to bring that to life through drama. We imagine how the world might be in 10 or 15 years' time. But before we can begin we need information and opinion. We spend weeks reading, talking to experts and compiling briefing documents before we tackle the drama. Our first film explores the potential of cloning and stem cell therapy. To give this courtroom drama real substance and moral complexity, we approached our research on several fronts: scientific, ethical, legal and political. Almost every day our research would throw up new information and the story would have to change. Then we made a breakthrough decision: we would make two endings - guilty and not guilty - and the audience would decide in a telephone vote. Our second film, If... We Could Stop The Violence, might seem like wishful thinking. But it reflects the views of cutting edge scientists who believe that the propensity for violent crime is genetic. If we can identify the "violent gene", can we stop the criminal before he commits the crime? The story of a Leeds schoolboy and his family balances some of the more extreme expert opinion in the film. Again, a story with ethical dimensions that will exercise your views on individual freedom and state control. At what cost to civil liberties would we make our streets safer? Lifting the prohibition on drugs offers a radical alternative that some of us will find abhorrent. But, sometimes, thinking radically about the future exposes our current failures. During the production of If... Drugs Were Legal we were always mindful of the dangers of drug use but wanted viewers to analyse their own preconceptions. We are not suggesting this scenario will really happen, but are offering a space to think in a new way about an old problem. To extend the debate and offer more context and analysis, Jeremy Paxman presents a special Newsnight debate to accompany each film. Here, some of the experts in our films will debate their position with a range of other opinion formers. In the end, you have to decide. 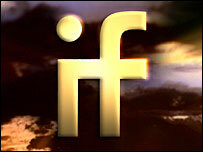 The second series of IF begins on Thursday, 16 December, 2004, on BBC Two.